"A flash of light, a brilliant star burst and instantly, an adorable little winged spirit appears. It's time to welcome your bouncing bundle into the world! Congratulations! You've just become the proud guardian of a Tamagotchi Angel. As a guardian, you have a very important task: to raise your Tamagotchi Angel well. Will your Tamagotchi Angel be sent back to its celestial home with a good spirit? It’s up to you to raise your Tamagotchi Angel with just the right measure of love and attention. If you're successful, your Tamagotchi Angel will fly home to be rewarded with its wings, if not, well… you can always try again!" features that other Tamagotchi released do not have. The Angelgotchi has a touch screen feature. This is used when it's eating a snack (chocolate heart) and a bat appears on the screen. You have to tap on the side or the screen to scare the bat away. If you don't scare the bat away your Tamagotchi will be sad. The Angel also features a new game. You have to jumps over shooting stars, and if it jumps over all five it will get 2 hearts filled (unlike the other 96-98 Tamagotchi releases). Discipline isn't required in this version. You praise it when it does a good deed. The Angel power r is like the weight on the Tamagotchi except you're supposed to keep it at maximum every stage of it's growth. 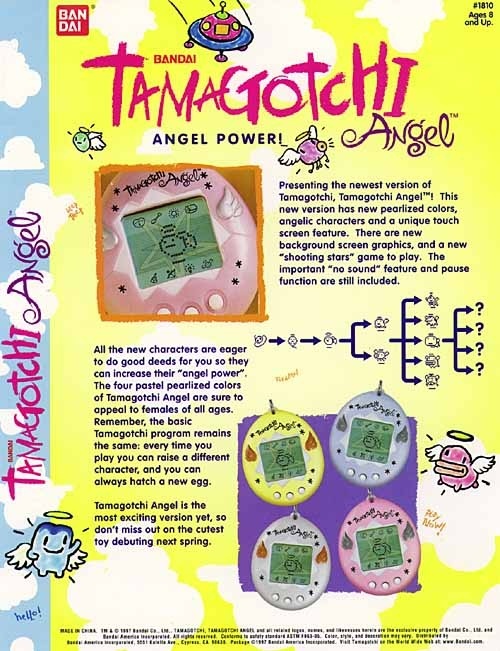 The characters on the Tamagotchi Angel are very different than the Tamagotchi characters. The only one that you can recognize is the second to best character Ginjiro-Shi. He is similar to the Tamagotchi version of him except he has wings and a halo. There are several secret characters such as the twins. The second one is a cactus, the third is a Devil, and the forth one is a poop.